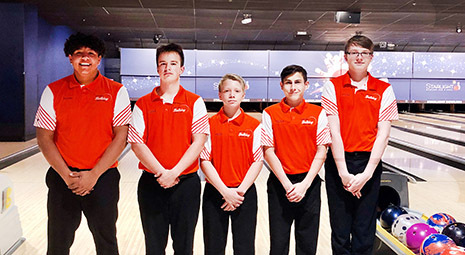 The Artesia High School Bulldog bowling team had seen themselves with a chance to win their past two tournaments in an Advanced Division that features Rio Rancho High and Cleveland High – two teams that have combined to win nine of the past 10 Class 6A New Mexico High School Bowling Association State Championships – only to come up a little short and finish in the runner-up position. Coach Ken Clayton said at the time that with the Class 5A State Championship only three weeks away, his team was peaking at the right time but was not satisfied with just competing with these 6A powers – the team was determined to win one of these tournaments. Fast-forward to Saturday at Starlight Lanes, where the Bulldogs opened the tournament with a five-man team game score of 1,064 and followed that with a 1,038 score for a two-team total of 2,102. The 1,064 team game and 2,102 team total are both the highest scores recorded in the 12 years of Artesia Bulldog bowling. The record total allowed the Bulldogs to carry a 103-pin lead over Cleveland into the Baker game portion of the tournament. The record effort to this point was led by junior Will Davis with games of 246 and 279 for a two-game total of 525, thus averaging 262.5 for his two-game effort and establishing a new school record for his series while tying the record for high game with his 279. Ethan Velo and Coy Moorhead each added scores that had them averaging over 200 for the day, with Velo having games of 228 and 198 and Moorhead games of 215 and 193. Zach Ingram and Justin Weddige completed the record with their games of 194 and 183 and 192 and 174 respectively. The Baker game section of a high-school tournament has each of the five bowlers roll two frames of the 10-frame game to create a full-game score. Seven Baker games are rolled each tournament, with 1,400 being an outstanding standard, thus averaging 200 per game. With the Bulldogs taking their 103-pin lead to Baker games, Clayton said it was important to get off to a fast start, especially since Baker game bowling is all about momentum. It’s pretty safe to say the coach was pleased with 10 strikes and two spares for a 259 and all the positive atmosphere you could ever ask for. The 259 game was followed with games of 191, 212, 224, 204, 202 and 214 to complete a record Baker series total of 1,506, a tournament total 3,608, and, most importantly, a tournament victory over runner-up Cleveland at 3,342 and Rio Rancho at 3,320. The 3,608 tournament total exceeds the highest tournament total ever by a Bulldog bowling team by 168 pins. “It was a special performance by our Advanced team that, needless to say, doesn’t come along very often, and it is appropriate that they be recognized for such an accomplishment. 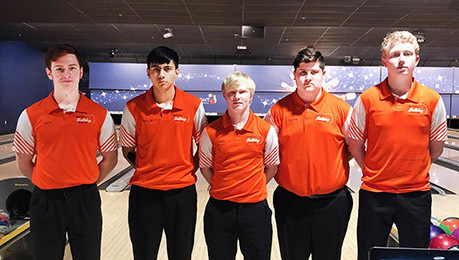 Coach Harvey and I have seen a lot of high-school bowling and have never seen a 3,600 or six school records in a day, but we will tell them good job, that’s over, now we focus on state in three weeks,” Clayton said with a smile. Maybe overshadowed but not to be outdone, Artesia No. 2 team won the championship in the 17-team Intermediate Division with a score of 3,078, which would have been good for a top-five finish in the Advanced Division. Artesia No. 2 was led by freshman Tyler Jeter with games of 257 and 197 for a 454 series, along with Kaden Sallee with 216 and 187 and a 403 series, Caden Brown 196-174, Xavier Ybarra 178, and Pecos Billups 156. Artesia No. 2 had high Baker games of 222 and 195. Bulldog bowlers also performing well at Starlight Lanes included Logan McNeely, 193, Joah James, 191-169, Parker Johnson, 191-155, Mady Pollard, 187, Alex Harmon, 181-179, Miguel Gallegos, 178, and Aaron Davis, 178.